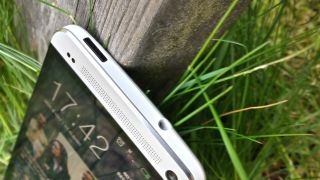 Those waiting on the edge of their seats for more HTC One Max news can celebrate today, as long as an unsubstantiated rumor of a slightly later HTC One Max release date is enough to satiate. The latest comes from the Chinese site ePrice, reporting that the HTC One Max will launch on Oct. 17. Previous rumors held that the HTC phablet would launch Oct. 15, so this report is not exactly blowing any minds. Either way, it's thought that HTC will time the One Max to go out around the same time as Apple's new iPads - and ePrice said it will cost about the same as the Galaxy Note 3, which is rumored near $950 (about UK£600, AU$1,000) SIM-free. The HTC One Max has been the subject of plenty of leaks and rumors. The device's alleged fingerprint scanner got our attention early on, even before the iPhone 5S was confirmed to have one of its own. And there have been plenty of pictures. Pocketnow said on Sept. 27 that the HTC One Max recently went through TENAA, the Chinese equivalent of the U.S.'s Federal Communications Commission, another sign that it's coming soon. Want a fingerprint scanner now? Try the iPhone 5S - and read our review right here.